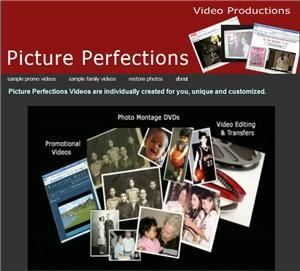 For weddings, mitzvahs, graduations, reunions and more, Picture Perfections creates one-of-a-kind montage video DVDs that add excitement, laughs and often tears of joy to your celebrations. Your slideshow includes your photos, music, captions and even home movies and tells your story in a most engaging and memorable way. Picture Perfections brings the perfect touch to the most important people and moments in your life. A keepsake now and for generations to come. For promotional and website videos, we transform video, stills and graphics into a new distinctive video that calls attention to you, your products and services.